My wife and I continue to work hard to payoff our mortgage. As of the end of June 2013, my wife and I will have lived in our home for 3 years and 4 months. We have a conventional, fixed-rate, 15-year mortgage and our goal is to pay off our mortgage in less than ten total years. As of July 1, 2013, we will have made 40 regular, monthly mortgage payments. We have also made several additional principal-only payments, too. We usually make our mortgage payment on the first day of the month, but we were able to make our July 1 payment a few days early. Additional principal-only payments are made throughout each month, as we earn additional income and find ways to decrease budgeted-for expenses. 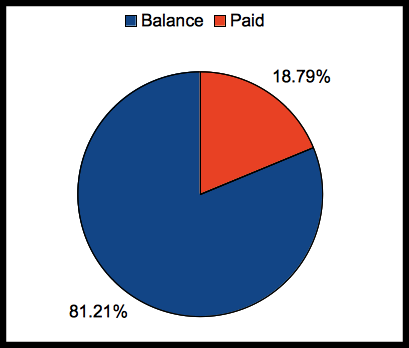 The blue percentage is how much I still owe – the balance. The red percentage is how much I have reduced – the paid. This chart reflects how much of our mortgage balance we have paid – not how much we actually own. That percentage would be much higher. We have made 40 regular payments and have lived in the house for a little more than two years. Our contractual remaining term is 11 years and 8 months , but our actual remaining term is 11 years and 2 months. We have reduced the length of our mortgage by 6 months! At our current debt reduction rate, we will payoff our 15-year mortgage in 12 years. While property values in our rural neighborhood have remained relatively stable, recent home sales in our area show a slight uptick in sales price. Interestingly, our property tax assessment for this year is actually lower than last year. Cool. Keep at it as there is no better feeling in having a home fully paid off and not having to write that mortgage check every month.